After some researching and background reading about the film Koyaanisqatsi, I found out the following information about the DVD releases that are in existence. There are two versions available on DVD, the MGM version which is widely commercially available, and the IRE version, whose transfer was commissioned by Godfrey Reggio for its pressing to DVD, several years before the MGM version was announced. The differences between the two versions are that the MGM DVD is in anamorphic widescreen, but bizarrely the IRE version, which is in fullscreen (4:3) resolution, gives a much greater view of the images. There is much debate as to which version was seen as the intended release, but regardless, this IRE DVD is an amazing version to watch if you are a fan of the film. Check a comparison here and here. As you can see, unlike the majority of 4:3 versions of films, the IRE version wasn't cropped to get it to fullscreen, but in fact was done the opposite way where the MGM version was cropped to get it down to its widescreen 16:9 aspect ratio. The IRE version is also sharper and better quality (with a higher bitrate) than the MGM release. The IRE version was released as a very limited release directly from Godfrey Reggio a few years before the MGM version finally came out on DVD, at a time when it wasn't sure if a studio was ever going to release it on DVD. This release via Godfrey Reggio's website was very very limited though and is loooooong since unavailable (except via eBay for over $150 per copy). Consider this a preservation commissioned by Reggio when it didn't look like any other DVD release of the film was due to happen. Now that MGM have released their version, the IRE version has been relegated to the same world as pre-commercial DVD bootlegs, it just so happens that the IRE version is better than the proper commercial release! Sooooo, for you preservationists and fans of the film, this IRE version is an extremely interesting and enjoyable version to have. A torrent of the IRE version is up and available to snag from torrentspy.com (search for "Koyaanisqatsi_IRE"), and is currently being seeded, so if you are interested, jump on it and get downloading (but please remember to seed this as long as you can once you've completed the download). I'm just the messenger, so no credit goes to me for the rip/preservation of this DVD, the version available via BitTorrent is a straight 1:1 copy of the DVD distributed by Reggio, seemingly no re-compression or alteration has been applied as the original happily fitted onto a DVD5 disc. I had no idea. I thought it was shot in the standard 35mm aspect ratio (1.85:1) originally. I used to have the IRE videocassette back in the day and, clarity of image aside, I definitely liked it more than the MGM DVD. The thing that really irritates me about the MGM DVD is that they are using a different version of the soundtrack. I'm not sure if they've mixed the original soundtrack for 5.1 or if they've used the re-recorded version that came out on CD a few years ago, but something about the soundtrack is most emphatically different. I'm guessing that Reggio's DVD probably has the original version. If this is the case, I would also be interested in tracking down a copy. I had no idea. I thought it was shot in the standard 35mm aspect ratio (1.85:1) originally. 35mm's natural AR is 4:3, though it's usually used to create a 1.85:1 image through either masking or the use of an anamorphic lens. Didn't it have a PCM 2.0 audio track as well? There are a couple of Laserdiscs of this on Ebay at the moment. Digital sound and open matte, according to the LDDB. So get downloading this people, its a great release, amazing to see the fullscreen and all of the amazing picture as Godfrey Reggio/Ron Fricke intended. You can get the torrent file from torrentz.com and torrentspy.com still and I will be seeding this little beauty as long as I possibly can as its a real treasure. I think it would be worthy of an upload to myspleen if possible by anyone (or if someone can instruct me how to get uploader privileges). while this is very cool and I will be downloading it, I do not believe it is "the full image as inteneded by the director Godfrey Reggio." If you look here there is quite a lot of discussion on the subject including some input from Joe Beirne the Producer of Naqoyqatsi, and the premiere of Koyaanisqatsi was presented in widescreen as intended by the director. Again this is very cool and thanks for seeding, I do like to see open matte versions of films just for comparisons sake. Thank you very much for seeding - I'll be sure to do the same as soon as I can! Just to add fuel to the fire, when I saw the film theatrically about 3 years ago it was presented 4:3 open matte - this would appear to be the format of the release prints as well as the original negative. Of course, few mainstream theatres these days are equipped to show 4:3, and I imagine it was much the same situation in the mid 80s - perhaps Reggio and Fricke simple allowed for the inevitable masking when creating the original compositions? I agree completely, I can't wait to get a look at this. hmmm, yeah, it is a bit of a mystery as to which aspect ratio was "intended", but it is very strange that A) the widescreen release is losing picture information unlike the majority of widescreen releases which have more picture than the 4:3 version. 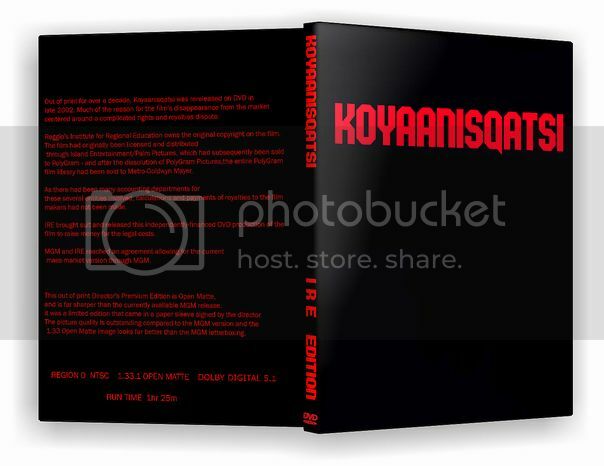 Also B) why would Godfrey Reggio, when putting up the money himself and releasing a very limited release of Koyaanisqatsi when it looked like an official release wouldn't be available for a long time/ever, would he release on DVD the 4:3 version? Surely he would release the version he most wanted people to see, encapsulating his vision of what the final version of the film should be presented as, so suggested this IS the "intended" version. I know what your saying about films being filmed in 4:3 then cropped in post production (I've doen it myself many times when making small films), but the uncropped version would NEVER get released. Very Bizarre, but either way, now we can have both versions!! ... and I'm really happy to get to see more picture in this version just like the version I had on VHS before I got the official DVD release. am downloading this from torrentspy.. it simply says _IRE at the end.. is this the right one? I had NO idea it was cropped like this. I am a long-time fan of this movie. ever since I saw it when it was originally shown back in 1983. I almost bought the DVD from Reggio, but it was just too expensive for me to afford. Is this because 4:3 is believed to be the intended aspect ratio or because it contains more picture information? I mean would someone be interested in making copies of the original dvd release of The Princess Bride. That was open matte too and I thought the 2001 widescreen only dvd chopped of people's hair a little too much. I believe Titanic should have been released on dvd in both wide and full screen formats because it was super 35 open matte. Both formats were released on laserdisc, but IMDB states the ws laserdisc was 2.20:1 while the dvd is 2.35. What aspect was the excerp shown in The Force is with Them: Legacy of Star Wars from the bonus sw disc? That's the one - looking very healthy at the moment, keep it up guys! yep Cassius76, thats the correct version to download from torrentspy The torrent named "Koyaanisqatsi_IRE". My computer as seeding away, my upload is kinda slow (wish my ISP would hurry up with its ADSLMax upgrade promise!) but I'm gonna be leaving it seeding for as long as I possibly can. I totally agree, it's still debated as to what the intended aspect ratio is (but I'd be inclined to think that the cropped widescreen version was MGM's decision and not Reggio's) but I would LOVE to see a HD version of this film. I have a HD XviD version of Baraka and it looks phenomenal compared to the DVD! Would be fantastic if Koyaanisqatsi could get the same HD remastered treatment. IMDb lists the "intended ratio" as 1.85:1, for whatever that's worth. A friend of mine saw the film with the Philip Glass ensemble a few years ago and I believe it was shown "in widescreen" (as he described it). There's a further comparison here. BTW, looks like I was wrong about the audio - they're both DD 5.1. Which raises another issue - how was that achieved? Did they really do a new 5.1 mix from the original music elements? Ahhh yes, I found that site while researching this but forgot to post it when making this thread. Just looking at the stills, the detail is noticably better on the IRE version, it looks alot more blurred on the MGM DVD. When watching the IRE DVD in motion you will see it has a much more "film grain" look to it, which some may like and some may not, but IMO, I think it gives it a really wonderful film look that alot of DVD's with their remastered sheen lose these days. Obviously it is a pretty straight transfer from the film print without loads of remastering filters etc. I didn't check the bitrate of the rip I have of the IRE DVD (I'm at work atm so can't clarify) but I would expect that it isn't a recompressed version of the DVD Reggio was selling as the film is only 85 mins long so most probably fits quite happily onto a DVD5 at 6.83mb/s bitrate. .... yep, a quick rough calculation would be ((6.83/8)x60)x86 = 4405.35 MB, therefore it looks to be just a straight rip of the DVD Godfrey Reggio was distributing, no shrinking/recompression applied Excellent. A cover would be great, Cassius - are you basing it on the official release or coming up with something better? Hope you guys enjoy the DVD, I think its fantastic, sooooo much better than the MGM release! Strictly, this thread actually infringes on the forum rules - if the IRE version was released on DVD (even if it is now out of print) then it is not a valid preservation project. However, I would consider that a very limited release direct from Reggio does not count as a full retail release, therefore this thread may stay (I trust Jay will agree). Just to let you know I'm paying attention! And of course, anyone downloading this should already own the MGM release. .... and yeah, make sure you own the MGM DVD people if you are downloading this, it's dirt cheap to buy now and it's worth it for the extras at least.